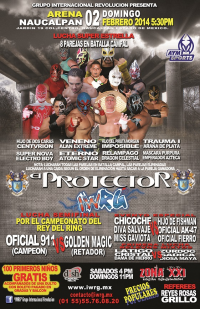 First IWRG match of the year for the women. Fishman's first match here since 2012. Eterno's return from leg injury. 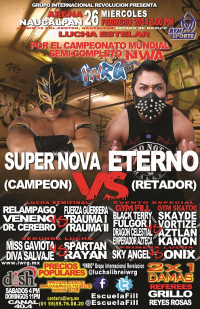 Alan Extreme & Veneno, the actual IWRG tag team champions, lose in the first round to a team that's never teamed before and may never team again. Tag team partners collide! 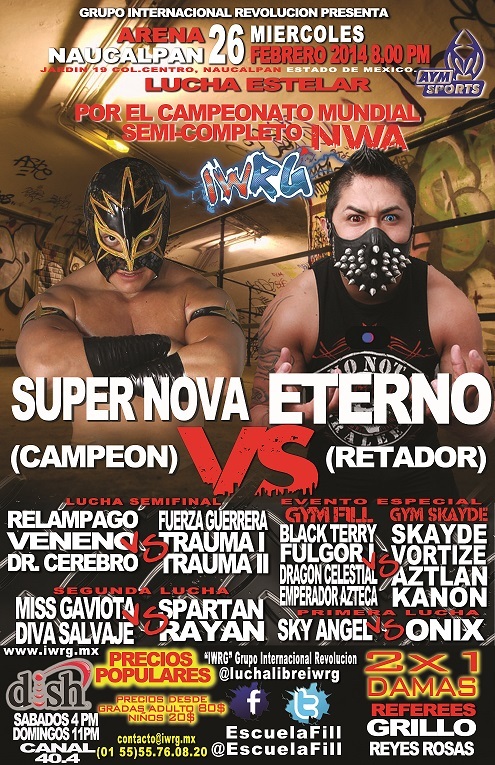 Both Eterno & Super Nova and Electro & Atomic are regular teams, and the younger guys are always wearing Eterno t-shirts. No one really wanted to do this match at first, but they eventually got into it. Super Nova beat Eterno & Electro Boy beat Atomic Star to win the tournament. Galaxy looked the best in the match, but was submitted by Electro Boy. 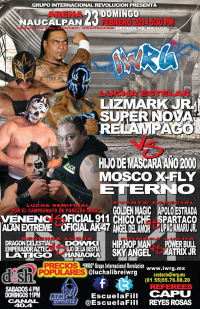 Blue Monsther's 11th FILL show without making a main IWRG show. Gym FILL (Black Terry) vs Gym Skayde. Aztlan snuck in a foul on Dragon Celestial for the win. Team IWRG complained to Skayde that cheating was no way to win such a contest - and Skayde agreed! Skayde said it was not professional and declined to accept the cup, proposing they have a rematch for it at some other point. Rudos took 2/3, 911 sneaking a foul in on Veneno. Oficials want a tag title shot. Super Nova had the chance to beat Vampiro in the first fall, kept pulling him up, and ended up beat. Eterno was not happy about this. 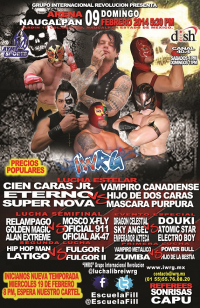 Eterno accidentally kicked Super Nova in the second, leading to Vampiro beating Nova again. Straight fall loss. Eterno & Nova argued more. X-Fly tried to calm them down, but Nova shoved down X-Fly. Eterno, X-Fly and Cien turned on Nova and pulled of his mask. Electro Boy replaced Spartaco/Spartan/whomever. Rayan's first match here since September. 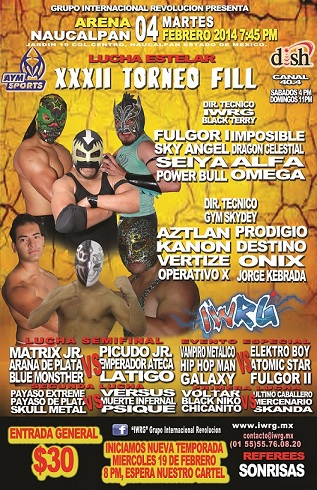 Tecnicos took 2/3, Eterno pulling Relampago's mask in the third fall. 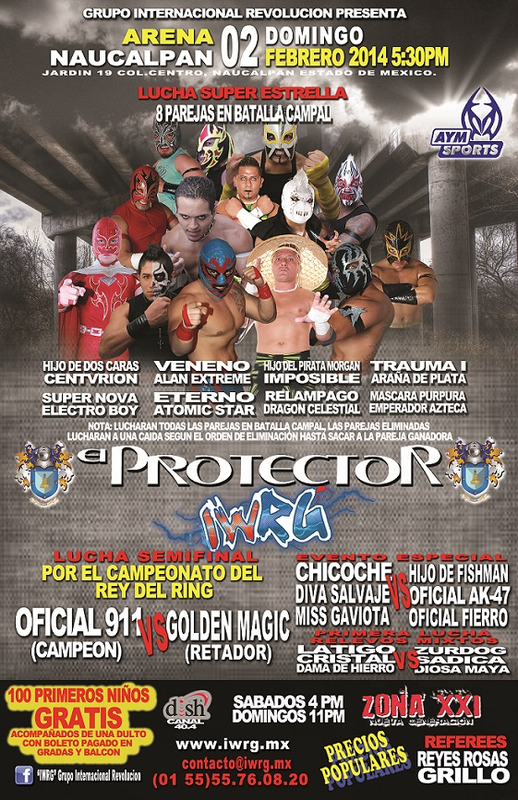 Winner gets a shot at Trauma II for his IWRG Junior de Juniors title. Luchadors were eliminated being thrown over the top rope (battle royal rules) until it got down to the last two, where submissions and pinfalls were also allowed. Brawling outside was OK, so there was a lot of that. 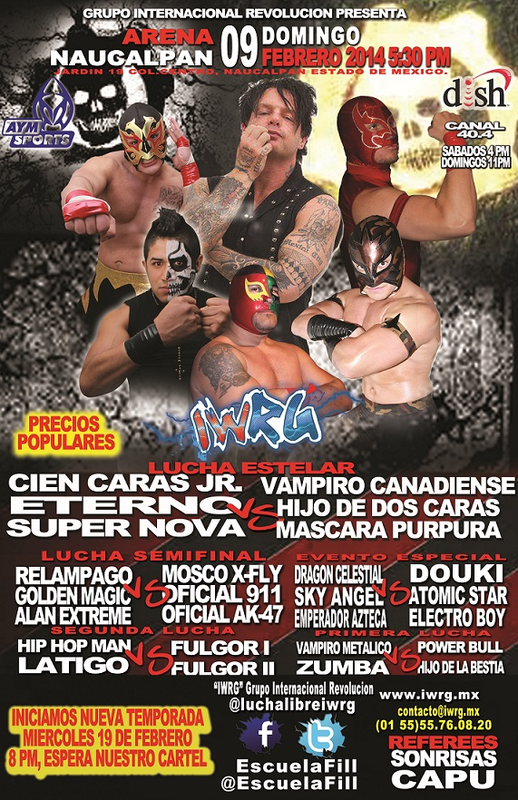 Elimination order: Fresero Jr., Hijo de Fishman, pirata Morgan, Mascara Ano 2000 Jr. (pulling each other out), Hijo de Dos Caras, Hijo del Lizmark. That left Nova and Trauma I, and Nova got some revenge for the Traumas putting him out of action last year by smashing Trauma I's knee with a chair a few times and submitting Trauma I to his own hold. Debuts for Mini Black Abyss & Rockerito. Atomic Star replaced Maiden, who would've been debuting here. Rematch. This time, it came down to Fulgor and Kanon. Fulgor twisted Kanon's mask, Kanon couldn't see, kicked wildly, and fouled the ref. Referee DQed Team Skayde and gave Team FILL the win. Again, thew inners would not accept the trophy that way, so they proposed a 4 students & Skayde vs 4 students & Black Terry match. Rudos took 2/3, Eterno beating Super Nova with a Styles Clash for the win. Eterno challenged Super Nvoa for one of this belts. Espartaco's debut. 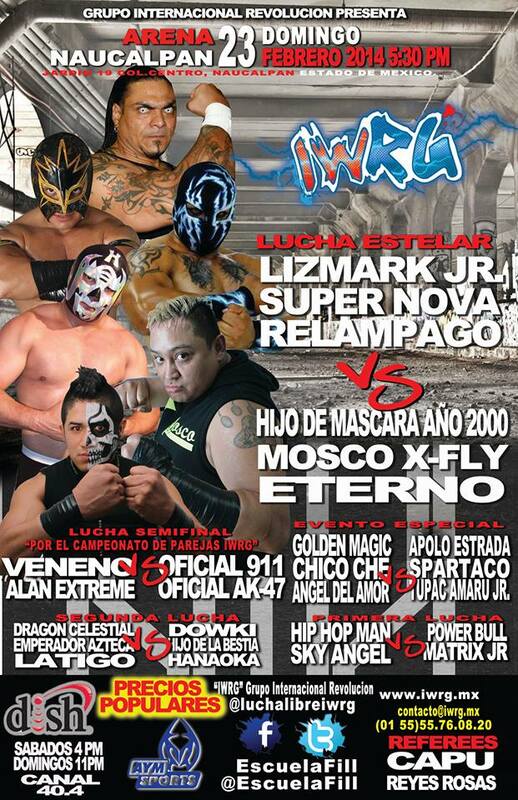 Apolo Estrada feuded with Golden Magic, beat him, and wants a title match. Veneno & Alan Extreme came in as champions. Oficals took the first, then got caught fouling the rudos in the second. 911 knocked down referee Capu in the third, 911 fouled Alan and covered, and 911 heard someone count three - but it was Veneno, not the ref. Veneno fouled 911 when he went to celebrate and put Alan on top for the win. Second defense. Rudos took 1/3. Nova was about to beat Eterno when X-Fly distracted him, and Eterno took advantage to for the win. Eterno & X-Fly took Nova's mask after the match. Skayde team won without controversy this time. Tecnicos took 1/3. Trauma II cheated to win the second, Doc did the same in the third.